We'll sit down with the psychedelic pop legends to talk about the stories behind their music and much more. BackStory Events and Guitar World invite you to join us for the live stream of our exclusive interview with psychedelic pop legends, The Zombies. The interview will take place at 6:00 p.m. EST this Tuesday, March 26, live from The Cutting Room in New York City. 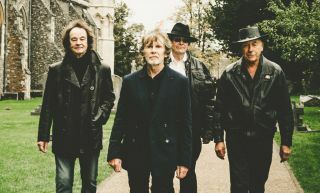 We’ll sit down with the four surviving members of the original Zombies — Rod Argent, Colin Blunstone, Chris White and Hugh Grundy — to share classic stories, new insights and how they feel about their induction to the Rock and Roll Hall of Fame. Then we’ll enjoy a few songs as Rod and Colin perform a short set. To find out more, visit thezombiesmusic.com or backstoryevents.com.